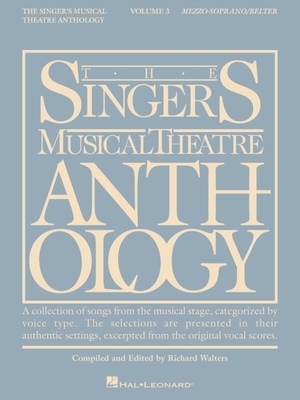 The Singer's Musical Theatre Anthology - Volume 3: Mezzo-Soprano/Alto Book Only (Paperback) | The Drama Book Shop, Inc.
(Vocal Collection). Contents: ANNIE GET YOUR GUN: You Can't Get a Man With a Gun, They Say It's Wonderful * THE APPLE TREE: Gorgeous * BEAUTY AND THE BEAST: A Change in Me * CABARET: So What?, Mein Herr, Maybe This Time * CHICAGO: Class, When You're Good to Mama * A CHORUS LINE: Nothing * COMPANY: The Ladies Who Lunch * COWGIRLS: Heads or Tails, Don't Call Me Trailer Trash * DO RE MI: Adventure * FOLLIES: Ah, But Underneath, Uptown, Downtown * FOOTLOOSE: Can You Find It in Your Heart? * FUNNY GIRL: Don't Rain on My Parade * GIRL CRAZY: But Not for Me * GYPSY: Everything's Coming Up Roses, Rose's Turn * I CAN GET IT FOR YOU WHOLESALE: Miss Marmelstein * I LOVE YOU, YOU'RE PERFECT, NOW CHANGE: Always a Bridesmaid * IS THERE LIFE AFTER HIGH SCHOOL? : Nothing Really Happened * JEKYLL & HYDE: Someone Like You, A New Life * LEAVE IT TO ME: My Heart Belongs to Daddy * MISS SAIGON: I'd Give My Life for You * PARADE: My Child Will Forgive Me, You Don't Know This Man * RUTHLESS: Teaching Third Grade * ST. LOUIS WOMAN: I Had Myself a True Love * SIDE SHOW: Who Will Love Me As I Am? * SONG AND DANCE: Let Me Finish, Third Letter Home * SONGS FOR A NEW WORLD: Stars and the Moon * SOUTH PACIFIC: Honey Bun * SUNSET BOULEVARD: As If We Never Said Goodbye, With One Look * WORKING: Just a Housewife * YOU'RE A GOOD MAN, CHARLIE BROWN: My New Philosophy.